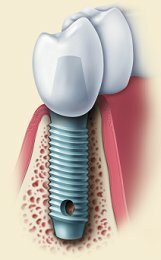 Rather than resting on the gum line like removable dentures, or using adjacent teeth as anchors like fixed bridges, dental implants are long-term replacements that your oral and maxillofacial surgeon surgically places in the jawbone. Twenty years ago, these patients would have had no alternative but to employ a fixed bridge or removable denture to restore their ability to eat, speak clearly, and smile. Fixed bridges and removable dentures, however, are not the perfect solution and often bring with them a number of other problems. Removable dentures may slip or cause embarrassing clicking sounds while eating or speaking. Of even greater concern, fixed bridges often affect adjacent healthy teeth, and removable dentures may lead to bone loss in the area where the tooth or teeth are missing. Recurrent decay, periodontal (gum) disease, and other factors often doom fixed bridgework to early failure. For these reasons, fixed bridges and removable dentures usually need to be replaced every seven to 15 years. 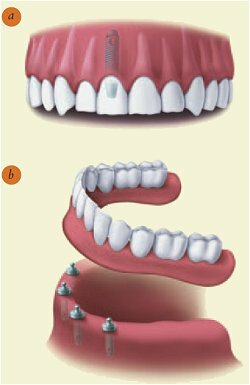 Many people who are missing a single tooth opt for a fixed bridge; but a bridge may require the cutting down of healthy, adjacent teeth that may or may not need to be restored in the future. Then there is the additional cost of possibly having to replace the bridge once, twice, or more over the course of a lifetime. Similarly, a removable partial denture may contribute to the loss of adjacent teeth. Studies show that within five to seven years there is a failure rate of up to 30% in teeth located next to a fixed bridge or removable partial denture. or cutting down of adjacent healthy teeth. Bone is maintained by the presence of natural teeth or implants (a). Bone loss occurs with the loss of teeth (b). A successful implant requires that all parties involved, the patient; the restorative dentist, who makes the crown for the implant; and the oral and maxillofacial surgeon, who surgically places the implant, follow a careful plan of treatment. All members of the implant team stay in close contact with each other to make sure everyone clearly understands what needs to be done to meet the patient's expectations. The team is organized as soon as the decision for placing a dental implant is reached. Following an evaluation that includes a comprehensive examination, x-rays, and a consultation with the patient and members of the implant team, the oral and maxillofacial surgeon surgically places the posts, or implants, in the patient's jaw.